The BatterySolver Package was developed as a solution for storing batteries or battery systems with the Battery Life Saver electronic device (BLS). The BLS operates from the power of the batteries. If the BLS is installed on a battery system, and that system is not charged for more than 7 days, the BLS will drain the batteries. 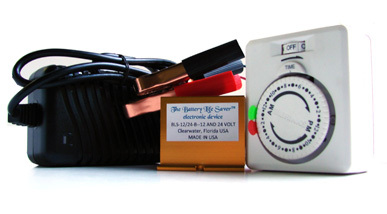 The BatterySolver Package includes the BLS, a floating charger, and a daily timer. Connect the charger to the same battery terminals as the BLS. Plug the charger into the timer, and set the timer to turn on once a day for 4 hours. This process will keep the batteries charged, and allow the BLS to keep the batteries in optimal condition.